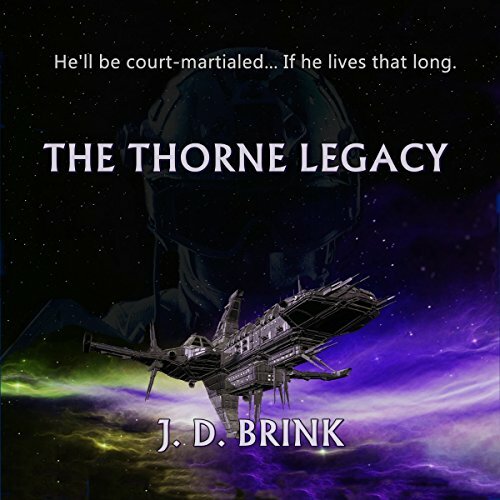 What would have made The Thorne Legacy better? A different narrator who doesn't use the gumshoe style approach to the story. Would you be willing to try another one of Lee Strayer’s performances? I think this would be best for males in the 18-30 yr bracket or sci-fi groupies. I have to say that the last 15-20 min of the story got rather interesting and I found myself wanting to hear the end which, of course, as a parent left me with tears rolling down my cheeks. Corporal Cranston "Cranberry" Thorne is a seemingly irresponsible member of the military, often demoted, and the shame of his father, Captain Thanos Thorne, and scheduled for court-martial. An alien invasion interrupts this. It turns into a story of redemption of honor of a son in the eyes of his father. The story is light and fun (with a serious turn), well written, and an easy listen. Overall, it is a short novella, and like the first episode or part of a book, as opposed to a novel. I'd love to read the complete story, and would suggest this is just bundled if of this length. I do want to find out what happens next though! It can't end like it seemed to - please! If you could sum up The Thorne Legacy in three words, what would they be? Narrator was good and sometimes I wondered was there more than one person behind voices. It was pleasure to listen story but somehow I missed the train and story just passed by. So there was no memorable moments or story arcs that would stay with me longer than story lasted.Anyway text was well written and I would like to read or listen more from this author and longer stories with more developement in this story setting. Now it felt more like watching continuous TV-show's episode in the middle of season and wondering what is going on. What does Lee Strayer bring to the story that you wouldn’t experience if you just read the book? His raspy voice made me feel being there myself.